Videogame Ragdolls - "Videogame Ragdolls 01"
I tried something new the other day. I thought to myself, what if my pictures were more like a video game? I mean, usually a main character is only drawn so many times in so many positions, and then the picture reused as a sprite over and over in all situations. Maybe that could cut down on time and allow for more in the way of consistent characters, if I could find a way to do something like that. The other challenge with following a video game style is of course trying to capture the experiences of the player into still images. 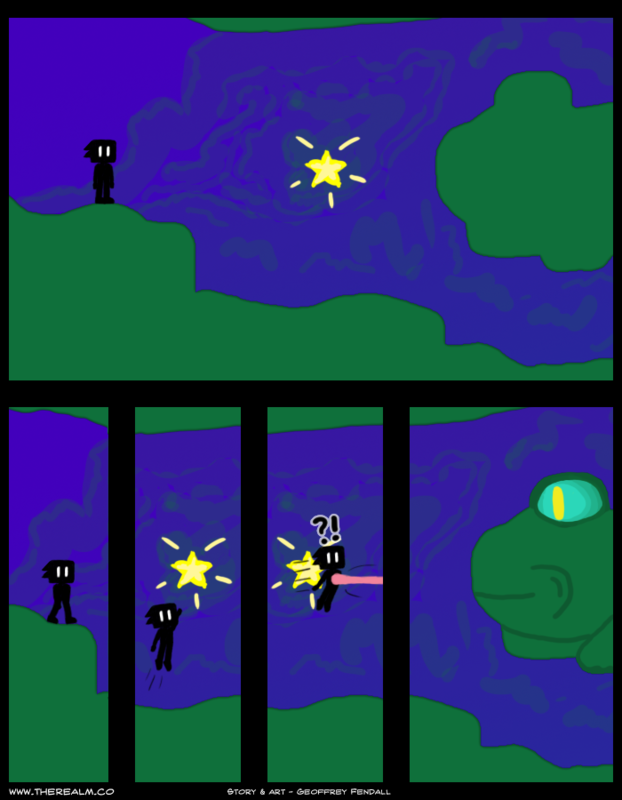 This comic, for example, tells a very simple story of (naturally) going for the star, only to find that it’s a trap. But even this simple story in comic form doesn’t quite capture the “oh” moment when the player realises they just got eaten by a giant frog thing. Difficult indeed. If you do the character side on (rather than isometric) then you have far fewer combinations to worry about. Perhaps he could get blown up by a bomb and have all his body parts fly in different directions? Lol, interesting idea. I’m pretty sure if you practice enough, the whole rearrangement stuff would get considerably faster. Ctrl-A to select the layer and Ctrl-T to transform…now that I think about it, it’d be REALLY fast…haha. Haha hmm well there’s also the problem of knowing where to rotate everything to. I mean, getting the poses looking good is harder than I thought it would be, even with a silhouette figure. >.< I can send you the psd if you want to try messing around with it. 😉 Lol Tony so violent! xD Hm yeah true side-on might be easier to do but in my opinion it looks worse. And you can't do as much with showing the front of the character and their expression etc... I dunno. Maybe I'll try it some time and see. In the second frame, theres some purple in the background which make it look like hes wearing a cape. Posing the mannequin is about the same as posing the dude…except then I’d have to pose the dude afterwards. It’s hard to make an active stance look natural when you’re just shaping a stiff, static thing. Hah, says you. I’ll draw another proper drawing when you get back to drawing yourself (and of course showing/sending me the results ;D ).